1. Don't buy that fabric just because it's on sale. Just because it's a good deal, doesn't mean it's a great fabric. Doesn't mean you need 8 yards of it, doesn't mean you should even buy a half-yard of it! Only buy what you love, even if it's not on sale. Fabric you love will get used. Fabric you bought on sale because it was a good deal will wind up still in your stash years later when you move and you'll be embarrassed/horrified/baffled you even own it. 2. Don't buy fabric just because it's the "cool" fabric at the moment. The only tastemaker in your sewing room is you. Much like other areas of sewing, beauty is in the eye of the beholder with your stash. If it's a fabric you're passionate about and love, you will find the right project for it. If it's the "hot" fabric of the moment and you feel like you're supposed to buy it, chances are it's going to land in the destash or donate pile at some point in your sewing life. 3. Variety is the spice of life - and stashing! Variety is important in a lot of different ways when it comes to stashing, but most especially it's important when it comes to value, themes, and in some ways scale. Value is the relative lightness or darkness of a fabric, and is often easiest to see in a photograph when the color is removed, and the photograph becomes simply black and white. It's important to have fabrics of different values, as it's one of the easiest ways to create contrast in your quilt blocks. Themes are important too. Unless you have an unhealthy addiction to polka dots and want to make all polka dot fabric quilts, you want to have a variety of themes or styles in your fabric stash. That might mean some stripes, some florals, some text fabrics, whatever - just a variety. As for scale, that's somewhat subjective. Take my stash, for example. I'd wager to guess at least 75% of my fabrics are small scale, meaning the print is quite small. Small scale prints are great for quilt blocks, because even in small quilt blocks, you don't "lose" the print. Often with larger scale fabrics, if you chop them up into pieces to make a block, you "lose" the print. So with scale, some variety is good, but it's nowhere near as necessary as with theme/style and value. Bonus: Enjoy the rainbow...not just one color! Make sure to share the love as you're stashing - don't just buy eleventy million blue fabrics. Because you will never sew through all of them. Never. It's been a long week. A nagging cold has turned into a super fun case of laryngitis, so I've spent most of the last week wildly gesturing like a not-so-masterful charades player and trying (mostly in vain!) not to talk. My voice is starting to make a comeback, ever so slowly, and I'm attributing most of that comeback to the healing power of fabric! Hopped up on cold medicine, I managed to cut into my stash of MoMo's Wonderland at long last this weekend! I've chopped up some of my fat eighths, along with some various solids I've pulled together that surprisingly coordinate nicely with Wonderland, and I'm making a Garden Lattice quilt from Cindy Lammon's Simply Modern Christmas book, which is a really fun holiday sewing book I've been enjoying recently. One of the things that awesome about Cindy's Garden Lattice pattern is how quick it is to stitch up! I pulled these blocks together pretty quickly, in just an hour or so after loads of pressing and cutting. I've got an idea for putting a little twist on these blocks that I'm hoping will make this quilt even better, but we'll see how that turns out. The last few days have been spent feeding my stash and my heart, quite literally. There's a few quilty drives going on to support the people of Boston after the horrific events that occurred last week, and I wanted to make sure to take part. Like so many of you, I was glued to the news last week and it left me feeling not only saddened and hurt for those affected by the violence, but it left me feeling rather helpless. Enter two wonderfully generous charity drives led by two modern quilt guilds. 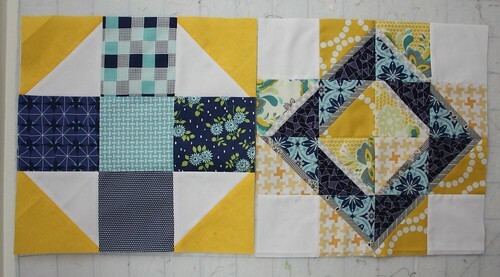 The Boston Modern Quilt Guild is collecting quilt blocks made in blues, yellows, grays, and whites measuring 12 1/2" x however wide you'd like. You can read more about the drive right here: Quilts for Boston. I've made two blocks so far, and might just make another before I send them off. I made a simple Mod Nine Patch block, based on my Moda Bake Shop tutorial from last year, and then I made a Double-Flip HST block, based on my old tutorial. The second project I worked on for Boston was a simple bunting flag for a great project that the Vancouver Modern Quilt Guild has put together, called To Boston with Love. My local MQG is working on putting together several flags and I'm hoping to make a few more before we send ours off. All flags must be in Boston by May 31st. You can read more and get more inspiration right here. In other lighter news, it seems my stash, although quite healthy in its own right, has been quite hungry lately, and I've been feeding it a steady diet of modern stash builders. I was introduced to a great new stash basic, the tweed texture print from JennSki's Mod Century collection for Moda, by the super creative Marla of Sew Hungry at The Stash Bash. Marla used one of the tweed texture prints in her Happy Pills quilt, and after she found the selvage, I knew I had to have some. You can find the Mod Century tweed textures in stock at Marmalade Fabrics (although I'm sorry to say I bought up all the gray!). The other modern basic I picked up is this fun print from Alice Kennedy's Matilda collection for Timeless Treasures. The chevron has a very sketchy quality to it, and I think it would not only make a great print to use in a quilt, but it would also make a great binding! You can find Matilda in stock at Fat Quarter Shop and Hawthorne Threads. On Saturday, we visited a beautiful quilt shop in McDonough, GA called A Scarlet Thread. It's a gorgeous shop, full of beautiful fabrics, sample quilts, and lots of fun, colorful DIY decor. I took tons of pictures of this shop because I enjoyed so much of the visual appeal of the shop. And naturally, I couldn't walk into a fabric store without buying fabric! I picked up some yardage of a Moda Bella solid for a quilt I was working on at The Stash Bash (stay tuned for more on that! ), as well as some cuts of Dear Stella Ostara Stripe, Tim & Beck Bungle Jungle Ivory Stationary, Penelope Calligraphy, Penelope Salon, and Silent Cinema Starlet in Pink. We also played an enthusiastic round of fat quarter swapping - modeled after LCR, if you're familiar with that. There was some vicious back and forth over a fat quarter of Constellations between myself and Amy/Needledfig! It was all in good fun, of course. Since I wound up with it, I think I might just make a little something for Amy with it, as a little Stash Bash keepsake. And the sweet Beth of Stash Fabrics was not only a Stash Bash sponsor but she was also there in person, with lots of her shop's beautiful fabrics. I took home a boatload of it to lighten her load on her way home! While the road trip to Stash Bash was great, the road trip home was less than great. Between the nasty weather and the ticket I got for speeding in Georgia, the drive kind of sucked. But, thanks to a serious downpour, I did take a little side trip to a quilt shop in Lake City, FL called the Fabric Art Shop, which cheered me up a good bit. They had lots of fabric and notions to look at and I snagged a few fun stash prints. I can tell I'm going to be spending some quality time unpacking and putting stuff away today! I better get started! This week, I suspect my sewing machine might just collect a little bit of dust, and no, it's not because I'm going to QuiltCon, because sadly I'm not. Instead, I'm preparing for my son's fifth birthday bash, coming up this weekend, and getting my house clean for some company coming in this week. Cleaning is not my idea of fun, so I've been doing a wee bit of adding to my stash this past week in the form of some retail therapy. I've snagged a fun stack of prints from Sweetwater's Noteworthy collection. I love the doodle-y feel of these prints, and the birds on the wire print is just gorgeous. Can't wait to use it. You can find Noteworthy in stock at Fat Quarter Shop. I couldn't resist picking up a few prints from Aneela Hoey's latest line, Posy. It's just perfect for low volume junkies, and there's a few fun stash builder prints in the line as well. You can find Posy in stock at Intrepid Thread. I've been doing some intermittent fabric shopping on Ebay lately - hunting for out of print stuff mostly that I'm running out of, like this fun print from Wordplay. I'm going to be pretty sad when I reach the end of this print, because it's getting harder and harder to find! Welcome to my stash post as a part of the Bella Parade, a celebration of the new colors making their debut this year for Moda's Bella solids line. I was given four of the new solids and asked to shop my stash for some fun pairings for these solids. I love working with solids, but I realized as I attempted pairing these solids with prints that I usually work in the opposite direction - finding solids that match prints that I want to work with! It took several auditions for my to find my final four prints to work with this solids stack. Now, admittedly, I'm not normally much of a purple person. It's a hard color to shop for in fabric, as the options are typically quite limited, but I was able to find four really great prints in the purple section of my stash that played really nicely with all four shades in my stack. Thanks for joining me today to hear about these four new colors - to learn more about the other new colors Moda has introduced, be sure to visit Shruti and Emily to read the other wonderful Bella Parade posts. I hope you'll join me tomorrow to make a fun, easy project using some pieced chevrons!